Take time for some Improv comedy at Sweet Fanny Adams Theatre in Gatlinburg this Friday and Saturday, March 8-9. 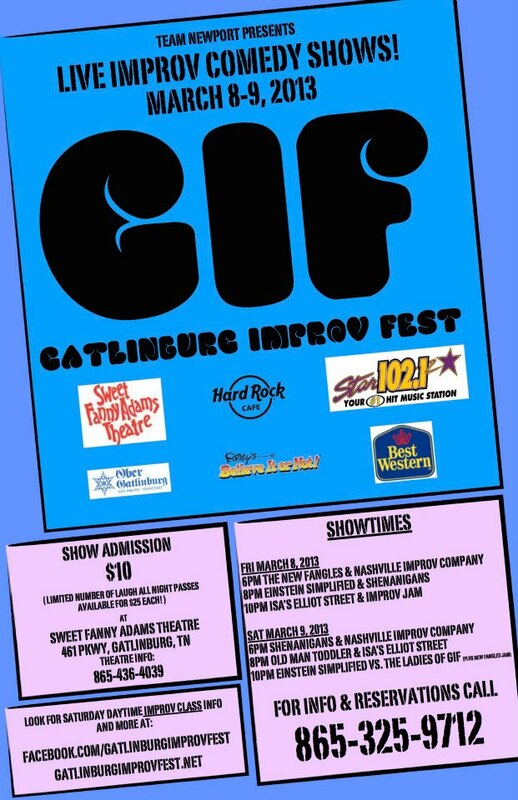 Gatlinburg Improv Fest 2013 brings us several talented teams in three unique shows each of the two nights, as well as workshops all day Saturday conducted by several of the visiting artists. 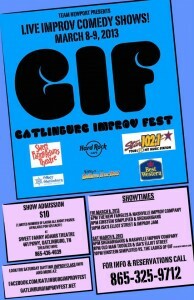 For details check the Improv Fest web site and also the show schedule. More news and information, including links to some of the visiting performers, can also be found at the Improv Fest’s Facebook page. Shows are at 6 pm, 8 pm and 10 pm Friday and Saturday evening, cost is $10 per person per show. You can make reservations by calling 877-388-5784 or 865-436-4039, or buy tickets at the door. See our feature article on Sweet Fanny Adams Theatre. The theater is located at Traffic Light #3 in Gatlinburg just around the corner from Ripley´s Aquarium and next door to the Hard Rock Cafe. You’ll also have a chance to meet and chat with the performers as the Cafe’s Free Music Fridays is given over to the Improv artists between acts. And the good thing about Gatlinburg is you can stay anywhere in the area and still be close – we have cabins across the whole area to suit your stay. Choose from our Pigeon Forge cabins, our Gatlinburg cabin rentals, and our Wears Valley cabins. Everywhere is close to anywhere you want to be.